Talk about a shocker coming out of left field! 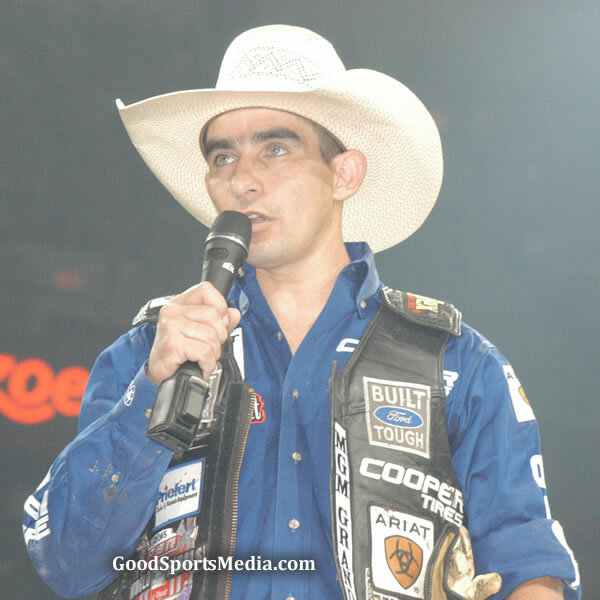 The 2010 PBR World Champion, Renato Nunes took center stage tonight to announce his retirement to a stunned crowd at the Thomas & Mack. In his announcement, he did mention that he has been thinking a lot about this and wasn’t sure when was the right time and for whatever reason decided tonight was that night. He never mentioned it to anyone and literary took everyone by surprise. For whatever reason, he decided the 4th night of PBR Built Ford Tough World Finals was time. Renato came into the 2015 Finals ranked 19th in the World but has been unable to ride any bulls so far. Not sure if it had any impact on the timing of his announcement, but in the last three rounds, we have seen several riders needing to be carried out on a backboard. Reminding us the dangers of the sport. Maybe its best to go out while you are on top and can leave on your own terms. The crowd was on its feet and gave him a loud and thunderous send off as he tipped his hat to the audience and walked back behind the chutes. This is one of those moments where we thank him for his love of the sport and the memories he gave us in the 9 times he made it to the world finals. At the same time, he gave the fans thanks for their support and helping him make his dreams reality by becoming a PBR World Champion. As the gentleman he has always shown to be and with the help of other Brazilian champions like Adriano Marias, Nunes will be a great International ambassador for the sport of professional bull riding and help to usher in a new generation of fans as well as riders. We look forward to seeing him at future PBR events and seeing what new opportunities his future holds.